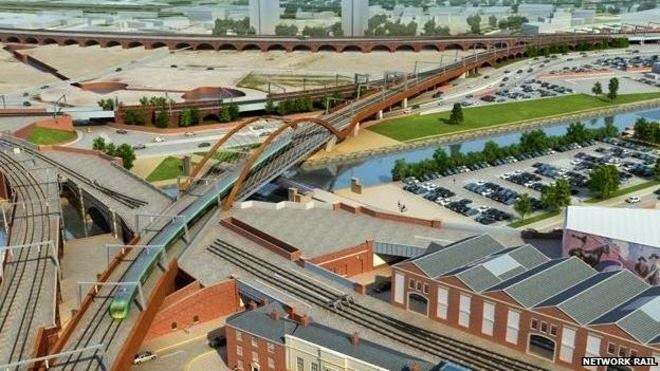 A viaduct which will connect three Manchester railway stations has been approved by the Transport Secretary, Patrick McLoughlin. The Ordsall Chord will link Piccadilly, Oxford Road and Victoria in the city. It is part of the multi-million pound Northern Hub upgrade for rail services across the North of England. Network Rail said it would ease a "rail bottleneck" south of Piccadilly and enable more trains to travel through Manchester city centre. The viaduct will enable an extra two fast trains per hour between Manchester Victoria and Liverpool and Leeds and Manchester, plus a direct service through Manchester city centre to Manchester Airport. As a result of the new rail link, Manchester's Museum of Science and Industry (MOSI) will lose its connection to the main line. The museum's site is the former Liverpool Road Station, which was the original Manchester terminus of the Liverpool and Manchester Railway. MOSI director Sally MacDonald said: "The construction of the chord is a reflection of the same kind of world-changing idea that first brought the railway to Manchester.